The NBA has always been about opportunity: When one team’s window opens, another’s often closes. This year, more than any in recent memory, is all about these windows: superstars in new cities, icons nearing retirement, general managers with a lot to prove, and franchises with little room for error. Grantland will be examining these windows for the next 30 days as we gear up for what could be a classic NBA season. Here’s a scary thought for Houston fans: What if the Rockets already missed their best chance to win a title with a James Harden–Dwight Howard core? If you dare bring this up to Daryl Morey, the team’s GM, be warned he’ll reject the notion before you’ve finished floating it: “My response would be, first of all, no,” he says. Morey has reason to remain confident despite an unfulfilled tease of an offseason that saw Houston nearly build a championship favorite by rounding third with Chris Bosh, deal away two valuable backups (Jeremy Lin and Omer Asik) to clear cap space for that dashed Bosh pursuit, and watch Chandler Parsons, in free agency a year earlier than necessary, go clubbing with Mark Cuban. Click here for more from our 2014-15 NBA preview. The Rockets rebounded with Trevor Ariza, a quality 3s-and-defense wing, on a four-year deal that carries a salary about $7 million below Parsons’s and descends over time. Houston snagged a more valuable first-round pick from New Orleans than the one it gifted the Lakers as the Jeremy Lin salary sweetener. The war chest also includes Terrence Jones, a big trade exception, and several high-upside guys on minimum contracts. They could have max cap room as early as this summer to resume the hunt for that elusive third star. Morey really believes that the Rockets will be better in April than they were last season, and Houston may have more trade assets than anybody else among the league’s top dozen teams. But Houston enters this season a bit worse than it finished 2013-14. The occasional step back has always been part of doing business, but the price of suffering one is higher than ever for a would-be contender built around veteran free-agent signings.1 Those contracts are so short now, requiring teams to prepare almost immediately for their expiration — and the next phase of team-building. Howard’s contract is a three-year deal with a player option in Year 4. The first year ended in a haze of defensive breakdowns and one flashbulb shot from Damian Lillard. The second starts at the end of next month with Houston, at best, a tier below the Spurs-Thunder-Clippers trifecta atop the West. In nine months, Howard’s deal will effectively morph into an expiring contract, and no sentient follower of the NBA wants a reminder of the candy-fueled hyper-drama Dwight Howard can inflict on an expiring contract. It seems preposterous, but the Rockets are already on the clock with the Howard-Harden core. When the NBA and players’ union agreed during the 2011 Lockout of Late-Night Pizza Death to reduce contract lengths yet again, some team executives and owners celebrated. They had been saved from themselves! Their awful mistakes would be three- and four-year pricks of pain instead of six-year albatrosses. The league quietly celebrated too. The NBA might never match the NFL in terms of parity (or even want to), but if contracts are short enough, it can become a 365-day adventure, with the most exciting offseason of any U.S. sport. Teams are just beginning to feel the comedown from the free-agency drug: Good contracts are as short as bad ones, and when those good deals expire, half the league is waiting with dump trucks of cash. This has huge implications for roster construction and competitive balance that the league is only beginning to understand. Teams are unsure how to create continuity, a renewed NBA buzzword, in a world where half the roster can switch teams every year. Every team should expect injuries, chemistry issues, and other problems to interrupt their development at some point. Those hiccups hurt more in a world of shorter windows; losing a season, or even just a month, carries a greater cost. Howard will be 30 in the summer of 2016, and depending on his play and the league’s financial landscape, he may look for security in a longer deal that carries him through his mid-thirties. This is a typical pattern. Successful first-round picks don’t hit unrestricted free agency until their late twenties. The age limit, a misguided artifact, makes it so that most guys are at least 20 by the time they enter the league. Rookie contracts cover their first four seasons, and restricted free agency takes care of at least the next three. The leaguewide feeding frenzy then begins, and old rules allowed teams to sign players for five or more seasons — deals that took players through their early thirties and into their age-related decline, a point at which many teams felt OK cutting bait or re-signing them on cheaper deals. The new wave of shorter contracts could have a host of impact players hitting unrestricted free agency a second time around age 30, a stage at which players are past their peak but still producing at near-prime levels. We are only starting to see this process play out. Guys like Paul Millsap and Al Jefferson will provide interesting test cases this summer, and Howard will follow in the summer of 2016. Dozens more will go through the same experience, since an unusual number of veterans have signed short-term deals in anticipation of hitting free agency again in 2016 or 2017 — when the new TV deal kicks the cap up. Will Houston really want to re-sign Howard, at age 30, to a five-year max contract? Size doesn’t age, but Howard relies more on explosiveness than most centers. He suffered shoulder and back injuries in Los Angeles, and he is visibly not the same athlete he was at his destructive peak in Orlando. He has always been in good shape, but even those around him would admit he hasn’t paid enough attention to diet and new forms of training and body maintenance that might prolong his career. Morey points out that Howard is only 6-foot-10, and not one of those 7-foot-2 behemoths with bad feet, broken knees, and other stress injuries that can accelerate the aging process. With Houston’s encouragement, Howard for the first time this summer worked out at P3, an increasingly popular training facility in Santa Barbara, California, that tries to correct mechanical flaws in the way players move. And Howard, to be clear, is still a phenomenal athlete. His success on the block has ebbed and flowed in Houston, but he looked more bouncy as last season went on, and he proved against Portland in the playoffs that he can still eviscerate opponents in the right matchup. He also dialed up the all-court brilliance on defense in wrecking several Portland crunch-time possessions. Howard can’t play that way all the time, but it was encouraging to see him unleash hell when it mattered. The Rockets’ confidence, of course, extends beyond retaining Howard and keeping him productive into his mid-thirties. Harden just turned 25, and has said all the right things about improving his horrid defense. Ariza is a better defender than Parsons, though he has to prove his 3-point shooting can be sustained without all the transition corner 3s that John Wall fed him. Patrick Beverley is legit, and Houston can pursue the unnamed third costar in both free agency and the trade market. 1. If free agency becomes a more important team-building tool, the teams with the most attractive markets might gain another edge. This isn’t something you hear only from small-market teams; their big-market brethren acknowledge the league might have inadvertently helped them a bit by prioritizing free agency. There is a reason the Lakers punted on signing any long-term contracts this summer. They could have signed Kyle Lowry or Luol Deng, but they avoided such commitments and rolled their cap space over for the next starry free-agent class. The Lake Show might be fooling itself, but they get meetings with every superstar who hits the market. You can say that for only a half-dozen or so franchises, including Houston. And, hell, a big-market team with cap room can swoop in and overpay one of those guys if the team believes he might be the perfect missing cog. This is not to say free agency is a losing game if you play it well. A team with, say, $25 million in cap room could have done signed Lowry, Lance Stephenson, and Kris Humphries, and then used its remaining exceptions to nab undervalued guys like Ed Davis and Al-Farouq Aminu. Teams can also still offer more money and one additional year to their own free agents, regardless of their cap situation. But, damn, that’s a hard game to manage. Free agency is an unscientific market with weird timing quirks and unpredictable human actors. It’s tougher to play from the inside. 2. The NBA’s pending new TV deal and the potential for massive salary-cap increases over the next three years might create a short-term blip in which already-loaded teams have more flexibility than usual. The luxury tax has become a de facto hard cap; teams live in fear of crossing it and triggering harsh repeater penalties down the line. But if the cap jumps fast enough, teams with lots of contracts on the books now might luck into more breathing space. In most cases, once you’ve spent on the big pieces, you have limited tools to fill the fringes. Max out on stars, and you might have just one summer in which the full midlevel exception — the real thing, not the miniature one for tax teams — is in your quiver. The cap is at $63 million today. If it leaps to $70 million next summer and approaches $80 million for 2016-17, a team like the Rockets can load more bullets into the free-agency chamber. A big-market team without any visible plan beyond a vague goal of luring stars might suddenly have room beyond two max-level slots — crucial for convincing stars to join an empty venture in Los Angeles or (eventually) Brooklyn. This is one reason the league might introduce new TV revenue in a way that spreads the cap increase over a longer period of time, per several sources familiar with the matter. The union has a seat in that discussion, since it has to sign off on any change to the formula that determines the cap, and it may not want Anthony Davis earning $10 million more per year on his max contract than Kyrie Irving does on his max just because Davis had the dumb luck of entering the league a year later. 3. The league’s proposed reform of the draft lottery has raised similar concerns. The NBA favors tweaking the lottery odds so the worst teams at the top of the lottery have a reduced chance of landing a top-three pick, with a corresponding improvement in odds for the best teams in the lottery. A small or mid-market team does not get a transcendent player like Davis (or Kevin Durant, or Tim Duncan) without drafting that player. Those teams didn’t like playing the lottery, but they used it to enhance their chances of nabbing a foundational player. And that’s fine! That is how rebuilding happens in most sports. With some luck, a small-market team can use the draft to balance the advantages that glamour teams have in free agency. There is a fear that evening out the lottery odds would chip away at that advantage; folks raised the same issue right away about the more creative Draft Wheel proposal that would rotate picks around the league. It’s hard to know now if this concern is valid, and there appears to be broad support among the league’s 30 teams for the NBA’s proposal, per several sources. Ownership groups could vote on it as early as this season, and a powerful distaste for Philly’s multiyear tanking adventure is driving the reform movement. 4. It’s harder to acquire a star player now via trade, since almost every player available will be at the end of a short contract — and close to free agency. The Lakers got burned with Howard,3 and when a star free agent spurns Los Angeles, the rest of the league quakes. 5. Speaking of the draft: It becomes an even more important team-building tool as veteran contracts get shorter. Drafting well and making smart trades for players on rookie contracts might become the only surefire way to bake continuity into your team. This is how you get a player for his entire prime. 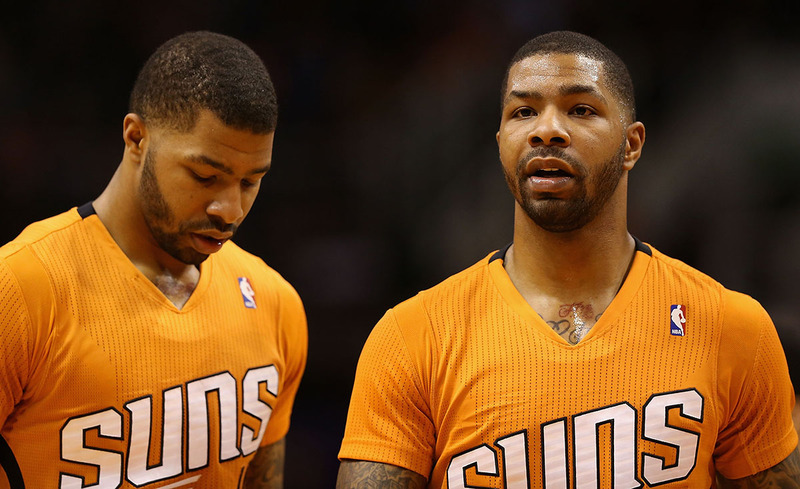 Phoenix doubled down on this with deals for Eric Bledsoe and both Morris twins. The Suns might be overestimating their core after a magical season, and they’ll be capped out this summer. But every one of these contracts could be a plus trade asset, and the team is betting the rising cap will give it major flexibility as early as the summer of 2016. If their core develops as hoped, the Suns could be selective entering free agency instead of diving in the derby every season to fill multiple big rotation holes. It’s probably not a coincidence that Philadelphia is undertaking the greatest multiyear tank job in league history, amassing a group of young players it could keep for nearly a decade at a time when free agency has become a more dangerous game. 6. The Warriors also signed Andrew Bogut to an extension, a smart (if risky) use of a tool the league accidentally rendered mostly useless. It’s hard to overstate how messy things got at the end of the lockout. The two sides were like a hopped-up Jessie Spano during an all-nighter, cramming in negotiations on complex issues that had gotten short shrift during months of arguing over the bigger stuff. With good intentions,4 the two sides trimmed the length of extensions even beyond other contract types. Superstars no longer have any incentive to entertain extensions, a deadly oversight for small-market teams hoping to coax a star into sticking around. The effect appears to have trickled down to non-star core players drooling over the prospect of free agency amid a rising cap. Teams can offer those guys only a 7.5 percent raise in extensions, and that raise is nothing compared to what they might get on the open market in 2016 or 2017. If I were in New Orleans, Memphis, or Portland, I’d love to talk extension with Ryan Anderson, Mike Conley, and Wes Matthews, respectively, but the conversation is a nonstarter. Another strike against continuity. 7. With so much turnover, it might get harder for coaches to introduce as much complexity into their playbooks. Simpler might be better for some teams, especially on offense. The free-flowing read-and-react offense that Kevin McHale and Chris Finch have introduced in Houston, where Kelvin Sampson once declared the Rockets had no actual plays, can work just fine for a team cycling through so many new players — provided that offense keeps flowing in crunch time. On the flip side, teams cannot waste time hoping any obvious weaknesses correct themselves. Houston’s patience with McHale and its decision not to add a high-profile “defensive coordinator” has surprised people around the league. Houston’s defense ranked 12th in points allowed per possession last season, but it was inconsistent and faltered under postseason stress. Houston is taking steps. J.B. Bickerstaff, the current defensive coordinator, is a rising star assistant coach. Houston today will announce the hiring of assistant coach T.R. Dunn, a longtime Rick Adelman assistant who was in Houston during the Yao Ming years — when the Rockets had perhaps the league’s best defense over a three-year span. The nature of Howard’s contract means Houston has to try like hell to pry open its window as much as possible — every summer, every trade deadline, every day. Welcome to the new short-term NBA. To be clear, James Harden was not a free-agent acquisition, though Morey says it felt like one. Veteran free agency below max-level players has historically been an inefficient market, in part because so many veteran free agents are past their primes; teams get less bang for the buck than on other sorts of contracts. That is not the same thing as saying the Lakers were unwise to trade for Howard; that was a great deal. They wanted to eliminate the kind of extend-and-trade deals that could hold teams hostage — e.g., the Nuggets with Carmelo Anthony in 2010-11.